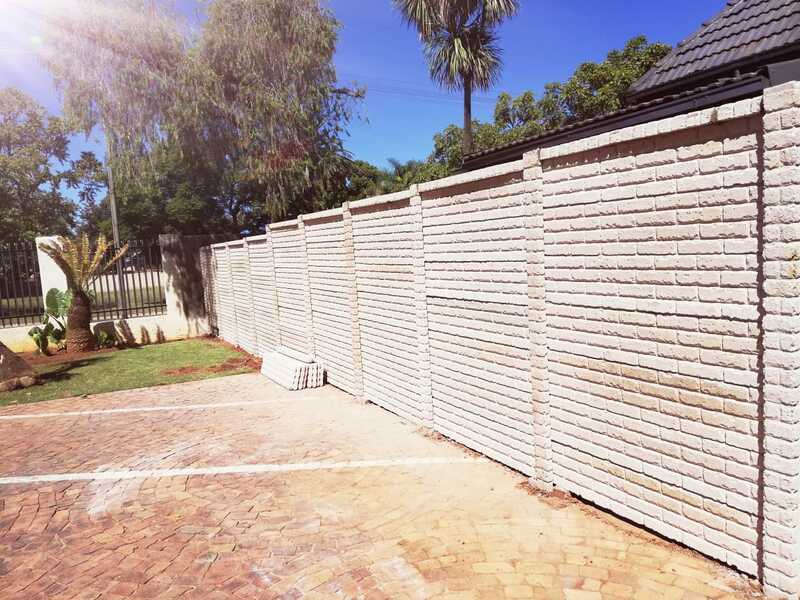 Our Plain coloured Brickcrete concrete precast walls are manufactured in Pretoria Gauteng. This is our most cost effective concrete precast bi-sided wall as there is no oxide mixed with the cement. The customer can then paint his/her concrete precast wall any colour to match the surroundings.These walls are all double sided brickcrete precast walls and have the same aesthetic quality of a solid brick wall on both sides of the wall, but costs a lot less. We have the biggest range on precast concrete walls in Gauteng. Stop nonsense walls, Vibracrete walls, Concrete walls is other discriptions for precast walls. All the same thing. There is no down side!! The Bi-sided brickcrete finish, makes it acceptable to residents on both sides of the wall. Imported oxide is used for colouring our precast walls and ensures long lasting colour. Brickcrete concrete precast walls will increase the safety and value of your property. No maintenance is required on all concrete precast walls. All brickcrete concrete precast walls comes with an optional cap rail trim that finishes off the wall. Concrete precast walls ensures a clean neat installation with minimal impact on your garden, time and privacy. We can also combine all our precast concrete walls as well as double sided brickcrete walls with steel palisades. At Exclusive Walls we install and supply the greater Gauteng area, incl Pretoria (Tshwane) and Johannesburg, as well as its surrounding areas such as Rustenburg, Bronkhorstspruit, Springs and Witbank. We also do extensions on existing walls as well as repair all types of pre-cast walls.